Doncaster RLFC half-back Liam Harris has joined Super League side Hull FC. The 21-year-old has been a stand-out performer for the Dons in League One this season, scoring six tries in ten games in all competitions. Harris has signed a two-and-a-half year deal with the Black and Whites. But the former Hull KR man could yet feature for the Dons under the dual registration agreement between the two clubs. Dons chief executive Carl Hall said: “All the deals we do for the Dons are in the best interests of the club both on and off the field, we have come to an agreement which suits all parties and Liam leaves with our best wishes. 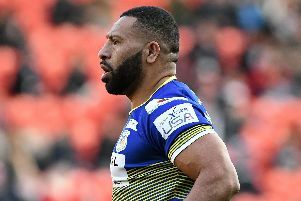 “He has done well since coming in and the fact a Super League club has come in for him shows how he has progressed under the coaching of Richard Horne. Liam Harris said: “I would like to thank everyone at the Dons for their help during my time with the club, I have really enjoyed my time here since signing and I wish them all the best for the future. “I didn’t expect to get the opportunity to play in Super League so quickly and I am grateful to the Dons for their understanding in getting the deal done.